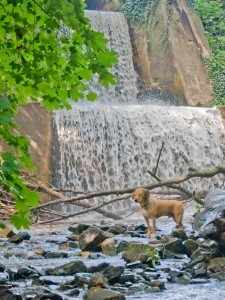 Dogs love the water at Glen Providence Park. The dam across Broomall’s Run was built over a century ago and created Broomall’s Lake, which was historically used as a reservoir, a place to harvest ice for ice boxes, and as a recreational swimming and boating resource. After many years, and the installation of a road on top of the dam, the structure is in need of reconstruction. It has been deemed unsafe by the Army Corps of Engineers since 1980. For a more detailed history of the project, read our History of 3rd Street Bridge/Dam. 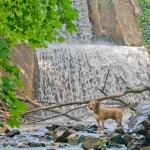 A portion of Glen Providence Park is under threat from the planned reconstruction of Broomall’s Dam. The current design and construction would damage 1.1 acres of the park where there is currently a waterfall, pool, wetlands and mature trees, replacing them with earthfill and grassy slope. No trees will be permitted on the slope. The design would also reopen the bridge to automotive traffic, compromising an area that has evolved into a peaceful pedestrian walkway through the natural areas surrounding Broomall’s Lake and Glen Providence Park. Friends of Glen Providence Park is seeking to positively influence the design of the project in order to minimize damage to the park and to prioritize the needs of pedestrians and cyclists. We encourage maximum public participation in the design and decision-making process. We have, in earlier phases of the project, created a petition, and supported dam removal and a pedestrian and bicycle greenway. In May 2012, Media Borough Council voted to move forward with dam reconstruction, despite clear public support for dam removal. In September 2012, Council voted on a compromise design for the dam with a one-way road, from Upper Providence into Media. We decided to support this compromise resolution for reasons explained in our Letter to the Editor. On September 28 2012, Broomall’s Lake Country Club (BLCC) filed a Petition for Contempt over the one-way road design. In February 2013, due to lack of agreement, Judge Proud vacated the Stipulation Agreement between the County, Media Borough and BLCC. We resumed our position in support of dam removal and stream restoration, with public discussion about an environmentally sensitive bridge between Upper Providence and Media Borough. Then in December 2013, the PA Commonwealth Court reinstated the Stipulation Agreement, and remanded the case to Judge Proud to resolve. On June 27, 2014, we were disappointed when Judge Proud ruled in favor of BLCC’s Petition for Contempt and Enforcement of Stipulation and Order. He ordered the Borough to “proceed with due diligence in compliance with the Stipulation and Order.” That decision did not resolve the underlying issues of dam ownership. 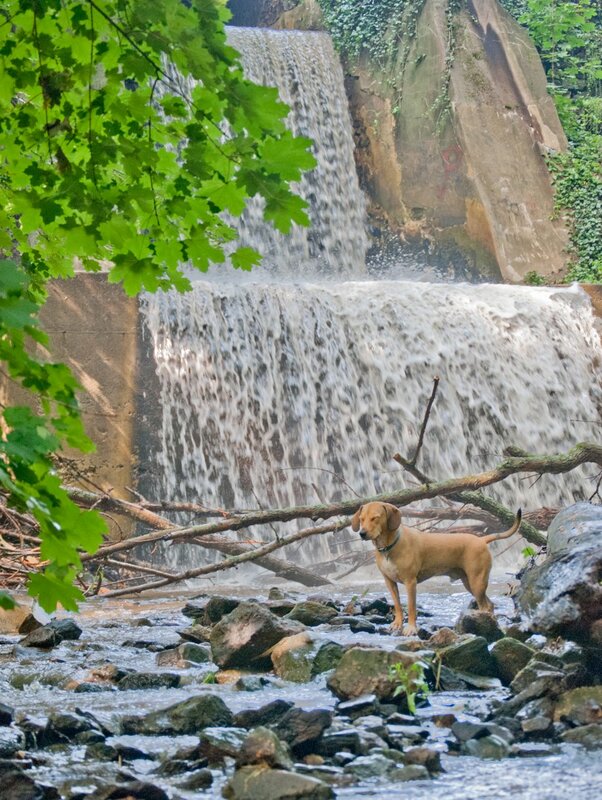 On July 16, 2015, Media Borough Council unanimously passed a resolution stating that Media was not an owner of Broomall’s Dam and they would not sign on as owners of Broomall’s Dam on the permit or Emergency Action Plan. In October 2015, the DEP (Department of Environmental Protection) announced that, for public safety reasons, they would do a controlled breach of the dam – currently scheduled for April 30, 2017. 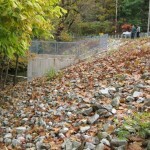 This is planned as a temporary partial dam removal until the proposed new dam is built. The ownership, legal, financial and safety issues make Broomall’s Dam and Third Street Bridge a particularly thorny and difficult issue to understand. See our 3rd Street FAQ to learn more about the stipulation, the funding issues and who is responsible for the dam. There are well over 300 pages of documents about this project on the Media Borough website. Take a few minutes and read our Guide to the Bridge/Dam documents, and decide which documents to review for yourself! Leading up to the August and October Public Meetings in 2011, we had a lot of questions about those documents and the project, which we submitted to the project engineers. Read our Condensed Q&A for their responses! 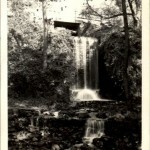 The waterfall from a 1940’s postcard. How the new dam might look – either stone or a grassy slope. The waterfall will not be replaced.